Biderman’s Deli is Austin’s go-to Jewish inspired deli, offering bagels & schmear, breakfast bagel sandwiches, lox, hot and cold deli sandwiches like pastrami, corned beef and reubens, as well as salads, traditional deli sides and soups (the Matzo ball is killer). Owned by Austin native Zach Biderman and Gabe Sims, Biderman’s has two locations in Austin, one off of Far West and one downtown at 800 Brazos. The cozy deli has a neighborhood feel and has a friendly, inviting staff whether you’re grabbing a quick bite or having weekend lunch with friends. Biderman’s has also recently partnered with local bagel phenom Rosen’s Bagel Co. and sources all of their outstanding bagels from Rosen’s. Our favorite for breakfast is the Lox Deluxe, a bagel topped with schmear, nova lox, tomato, onion, and capers; and for lunch, The Max, piled high with corned beef, turkey, Swiss, coleslaw, and Russian dressing on Rye bread. Don’t forget to grab a Black & White cookie on your way out! Around these parts, melted cheese is serious business. Any great meal in Austin can and should begin with a velvety bowl of queso— locally, it’s one of our main food groups. A great queso recipe can not only put a new restaurant on the map, it can make it an institution. Luckily Favor, your personal delivery assistant, understands that queso is the lifeblood of our fair city, and they are standing by to bring your favorite blend of queso straight to your door. With that in mind, here is a list of the quesos we can’t live without. Use code ‘365Things’ to get your first Favor free! Their green chile queso may be even better than their tacos. That’s a major statement, but we stand behind it! Save this one for a late night craving as this is queso is one you can enjoy 24 hours a day! This classic Austin joint makes nearly every “best of” list for good reason. Bob Armstrong Dip is a truly heavenly version of queso. Just make sure you don’t go on Tuesday (they’re closed)! Many moons ago, on a past Cinco de Mayo, we judged a blind queso tasting contest and this guy was the winner. El Alma gets bonus points for the homemade chips that come with its queso. It’s a stellar combo! This bowl of melted goodness has a distinctive flavor that keeps the queso connoisseurs coming back. Is it butter? Garlic? It’s AMAZING is what it is. Another place where you can snag queso 24 hours a day, this one known as “Magnolia Mud” is dangerously addicting. This white and peppery queso is rich and savory. It’s the perfect thing to distract you during those five looooong minutes you have to wait for their incredible tacos. Don’t be fooled by its humble (and dark) appearance. This queso is worth the stop. Melted cheese with hatch green chiles. Need we say more? The Vidal family’s food truck is famous for brisket, but their chips y queso are to die for as well. This bowl is old-fashioned and devoid of trendy nonsense. You can’t go wrong. Down and dirty bar food is one of life’s simple pleasures, and this queso is pure bliss. Photo Credit: Meredith V. Yelp. Queso with a view? You don’t have to ask us twice! This is all you need to know: Land O’Lakes extra melt with whole black beans, guacamole and pico. This queso comes standard with bonus ingredients. You’ll love every bit of melted American cheese topped with guacamole, ground beef, and pico de gallo. Cream cheese is the secret ingredient that sets them apart from the rest! Get any (or all) of the quesos above, delivered right to your door with the Favor Delivery app. Only two short years ago, one could count pizza delivery options in Austin on two hands. The choices were those inedible national chains, or Gatti’s/Austin’s Pizza, and a few others (we still love you Conan’s). Oh, how the times have changed. With Favor Delivery, pizza is a few clicks away from anywhere that offers take-out. In fact, a large pie from my favorite shop for thin-crust, East Side Pies, was the first Favor order I completed. I included a few newcomers on the list, so hopefully there are a few places you haven’t tried. Take into consideration that your favorite spot might not be on the list purely because it’s not in the Favor delivery zone. Or it could be that we haven’t tried it! Feel free to hit us up on Facebook with your recommendations. When it first opened, one could expect to wait hours to get a table. They’ve recently (and quietly) begun to allow takeout orders. Take advantage. It’s the best neapolitan pie in the city. The trailer-turned-brick and-mortar on East 6th is open until 3am on weekends. Skip that Whataburger line and order from the safety of your own living room. Known for his puccias (authentic wood fired Italian sandwiches), Lucky recently opened a brick and mortar on West 5th. The pizzas are as crave-able as his signature sandwiches. This South First Street newcomer has quickly climbed into our top ten. Try the Hot Honey if you’re into eating things that taste good. This Crestview neighborhood gem gets very little press considering it makes one of the best New York style pies in the city. Loved by tourists and locals alike, no list would be complete without a nod to Homeslice. They also take the cake (pie?) for the most often Favor-ed pizza joint in Austin. Before you say, “but I don’t like deep-dish pizza,” let me comment that I didn’t either until I tried Via 313. Furthermore, I haven’t met a person who has tried it that hasn’t fallen in love. Want to find out if you’re in Favor’s delivery zone? Check out the map. Ah, the great Austin breakfast taco debate. The subject creates heated arguments amongst best friends and loved ones, not to mention internet commenters! So, don’t think of this as a ‘Top 10’ list, take it as a list of 14 of the taco places we currently love the most. If we missed one of your top picks, feel free to share it in the comments below. Happy National Taco Day y’all! There's something about putting breakfast in a taco that just makes sense. Not every restaurant gets it right, but these ones do. 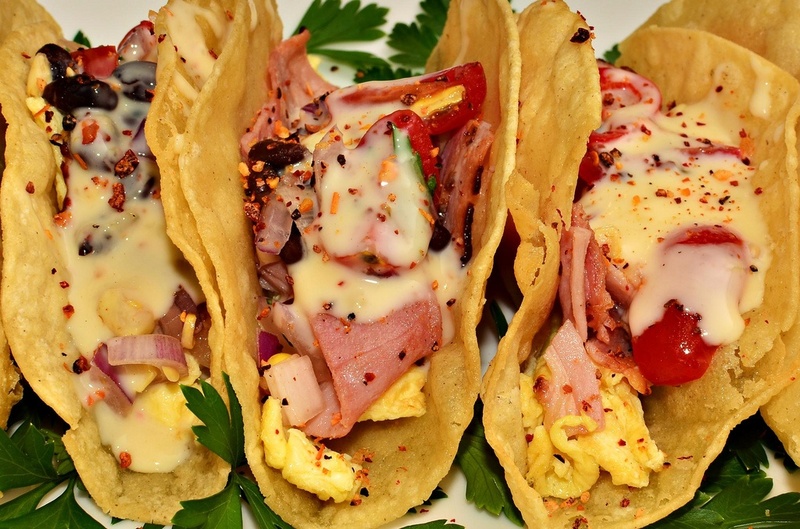 Check out these 14 amazing breakfast taco joints in Austin. There’sno substitute for fresh tortillas. When you're at Joe’s, the tortillasare made no more than 20ft from your table. Ifyou like to build your own tacos, I highly recommend the Joey Rocha Plate. If I had to pick a personal favorite on thelist, Veracruz would be it. Their tacos aren’t flashy, andthe menu isn’t as exotic as Taco Deli, for example, but they just makeconsistently great tacos. Ground beef doesn’t sound like an appetizing breakfast ingredient, but for some reason I always snag the ground beef, Mexican rice & cheese along with my more traditional bacon, egg, potato & cheese. To be clear, we’re talking about Rosita’swhite trailer on East Riverside. They make their thick & chewy flour tortillas fresh daily & their chorizo, egg & potato taco is the ultimate hangover cure. The thing about Taco Deli is that you either love it or hate it. While their offerings aren’t traditional, I personally love it, and it’s usually the first place I take friends from out of town/state. The original Tamale House on Airportclosing was unfortunate, but losing this family’s contribution to the localfood scene completely would be a tragedy! Do your part and check out this gem. It looks sketchy from theoutside, but the folks inside are welcoming. I haven’t found anything that I don’t love, but try the spicy potatoes. They look like fries but taste like breakfast potatoes. There’s something special about eating at this iconic establishment. Be sure to to look at the pictures, articles, etc. posted around the restaurant; if these walls could talk! Cheap. Fast. Delicious. What else do you need? The fact that they’re open 24 hours is enough reason for them to be on the list, but they actually serve some great tacos. Adding a cookie from their beautiful display to your order won’t hurt either. I get that this place is expensive, especially when it comes to their chicken. But they do have great (not terribly expensive) breakfast tacos, a drive-through & Stumptown Coffee. Amaya’s family-owned feel & focus onexceptional service have built them a healthy following over 40 years,and I’m definitely a huge fan of the place myself. 3 item breakfast tacos start at $1.39. No Austin taco list is complete without a nod to the people’s champ. I like them more for their chips & guac & secret taco menu, but I know y’all would be up in arms if I didn’t include them here! This trailer serves up some of the bestbreakfast tacos in Austin. I always go for the homemade chorizo; it's a gooey delicious mess of breakfast foods, folded perfectly into a freshflour tortilla.